This study is the first comprehensive examination of the impact these entrepreneurs are having, the risks they face, and whether a viable business model has emerged for quality, independent, digital journalism. 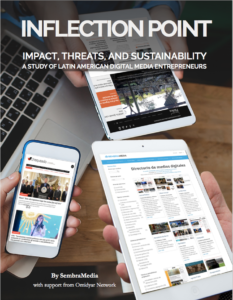 To conduct this research, SembraMedia, with the support of Omidyar Network, commissioned a team to study 100 digital news startups, 25 each in Argentina, Brazil, Colombia and Mexico. Many of the researchers were entrepreneurial journalists themselves, and they brought personal connections and a deep understanding of the media in their countries. In 2-hour interviews with founders or directors, they asked more than 130 questions about management and innovation, challenges and opportunities, audience size and engagement, income and expenses. This report is aimed at helping the founders of digital media startups better understand the trends, threats, and best practices that affect them. It is also designed to help investors, foundations, and journalism organizations appreciate the value, vulnerability, and impact of this fast-growing media ecosystem. Although we cannot share their proprietary data, we’ve included our top-level findings in this report. Enter your email and we will send you a message with links to download a PDF version of the report in English, Spanish, and Portuguese. We'll also send you one SembraMedia newsletter and an invitation to subscribe. We promise we'll never send spam or sell your address to third parties. Check your email for a message with links to download the report. Didn’t receive the email with the link? You can download a PDF of the report in English here.